ਬੋਲੀਵੀਆਈ ਬੋਲੀਵੀਆਨੋ Bolívar sometimes Bs.F. BsFBs.F. Bolivarਵੈਨੇਜ਼ੁਏਲਾਈ ਬੋਲੀਵਾਰ variant ਆਮ ਤੌਰ ਉੱਤੇ Bs. chCh. chhertumਭੂਟਾਨੀ ਛਿਰਤਮ A centesimal division of the ngultrum. C2₡ Colonਕੋਸਟਾ ਰੀਕਾਈ ਕੋਲੋਨ Also used for the former Salvadoran colón, which was discontinued in 2001 in favor of the US dollar, but remains accepted as legal tender. DKد.ك DinarKਕੁਵੈਤੀ ਦਿਨਾਰ ਲਾਤੀਨੀ ਰੂਪ: K.D. DinДИН DinarSਸਰਬੀਆਈ ਦਿਨਾਰ ਲਾਤੀਨੀ ਰੂਪ: din. Tongan paʻanga May appear with either one or two bars, both of which currently share the same unicode space. E€ Euroਯੂਰਪੀ ਯੂਰੋ In addition to the members of the eurozone, the Vatican, San Marino, and Monaco have been granted issuing rights for coinage but not banknotes. Fr₣ Franc CoComorian (CF), Congolese (CF), Djiboutian (Fdj/DF), Guinean (FG/G₣) and Swiss (S₣) francs Also F and Fr. EE LilangeniSwazi lilangeni Sign based on the plural form "emalangeni. lplp Lipaਕ੍ਰੋਏਸ਼ੀਆਈ ਲੀਪਾ A centesimal division of the kuna. M1M Lotiਲਿਸੋਥੋ ਲੋਤੀ Sign based on plural form "maloti. M2 Manatਅਜ਼ਰਬਾਈਜਾਨੀ ਮਨਾਤ Also m. and man. ptPt. qirshਮਿਸਰੀ ਕਿਰਸ਼ A centesimal division of the Egyptian pound. Rialريال Rial Iਇਰਾਨੀ ਰਿਆਲ Script for "rial," a currency name also used by other nations. Transnistrian ruble The penny is now a centesimal division of the pound. ss santimsਲਾਤਵੀਆਈ ਸੰਤੀਮ A centesimal division of the lats. WSSWS$ Talaਸਮੋਵੀ ਤਾਲਾ Sign based on previous name "West Samoan tala." ↑ Centrale Bank van Aruba. About Us - A Brief History of the Bank." Accessed 23 Feb 2011. ↑ 5.0 5.1 Forexforums.com. 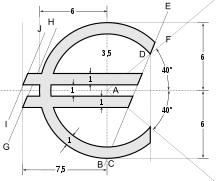 "Currency symbol finder." Accessed 24 Feb 2011.